At a suggested retail price of $27,000, 2017 Topps Transcendent Baseball Cards is THE most lavish, premiere, high end case of Baseball cards available. Everything about this set is premium, right down to its custom wooden case that alone, without any contents, sells for $450 on the aftermarket. If the set’s price tag is not within your reach, there are group breaks with spot entries as low as $160 that could net you an individual item from the set valued at $4,000, if not more. We’ve been tracking as many breaks, individual postings, aftermarket sales of this year’s Transcendent to see what is out there and what might still be in unopened cases. We say might because there could be several collectors who have stashed their cases away. 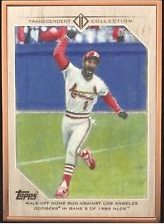 Here is the complete checklist for 2017 Transcendent Baseball with links to eBay incase you want to try to pick up an item on the secondary market. Next to the item, we will keep updating when a 1/1 item gets pulled and track what we feel are the number of cases broken to date. Cases broken - current count that we know of that we have full details on their contents is 74 and at least 11 private cases that we are waiting for a reply on for a total of at least 85 cases opened. 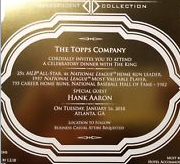 With 34 cases broken, only 5 party invites have hit the aftermarket, making this potentially one of the most exclusive and highly sought invites in the sports card industry. 43 Signers this year and a change from last year’s configuration. This is each player had two different images/two different cards. this allowed numbering to stay low. Base was #/25, Silver -#/15, Purple - #/10 and two different 1/1s, a Red and a Gold. With the different images that means there are 4 possible 1/1s per player. Here is the checklist and what has been pulled. As a bonus to the 50 included player autos per case, 3 redemption autos are included in a side envelope. Just as with the regular signers, these redemptions are numbered to 25, 15, 10 and 2 1/1s with two versions of the cards, except for Lindsey Vonn who only signed one photo variation, which is why she is listed as having only 2 possible 1/1s. This year’s hottest rookie, Aaron Judge, is the subject of stylized 1/1 autographs using design elements of previous Topps Baseball flagship releases. One autograph is included in each case. To bridge the gap of 87 total cases, the first 21 cards on the checklist are insert of alternative release versions of the years listed. 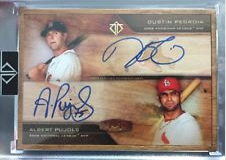 Another 1/1 included at the top of every case is a regular card sized, encased 1/1 hit autograph. The MVP autos have three varieties, MVP Single Signature, Dual Signature and Cut Auto. 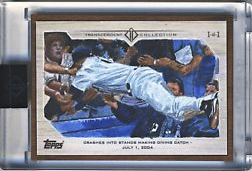 PULLED - MVPA-CRJ Cal Ripken Jr.
Also on top of every case you will find one of these framed beauties. The oversize on these allows for the full signatures to be boldly displayed. PULLED - TCS-DES Dale Earnhardt Sr.
Another 1/1 offered inside each case is a original hand drawn sketch. 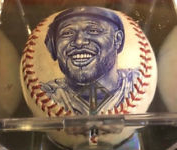 Some of these are sketched on authenticated game used baseballs sketched by artists Mayumi Seto or Monty Sheldon. Other sketches were on cards by artist Dan Bergren that were then reproduced as one of the two sets included in each case. These include MLB Authentication Stickers that can be used to trace the origins of these game used balls. These are the 1/1 sketch versions, signed on the back of the card by the artist. PULLED - MLBM-CR Cal Ripken Jr. PULLED - MLBM-CRI Cal Ripken Jr. PULLED - MLBM-KG Ken Griffey Jr. 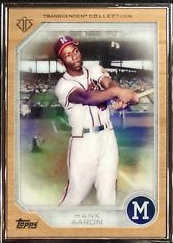 PULLED - MLBM-KGR Ken Griffey Jr.
Every case has two sets of cards, Base and Sketch Reproductions, numbered to #/87 with the numbering matching to the number found on the wooden case.